the 22-year cycles of magnetic activity. caused by the Terrestrial planets. side-lobes, one at 1.28 years and the other at 2.13 years. driving the fundamental solar oscillation that Howe et al. 2000 had observed near the Tachocline boundary. Imagine that Venus and Earth are aligned directly above a point A that is on the surface of the Sun. 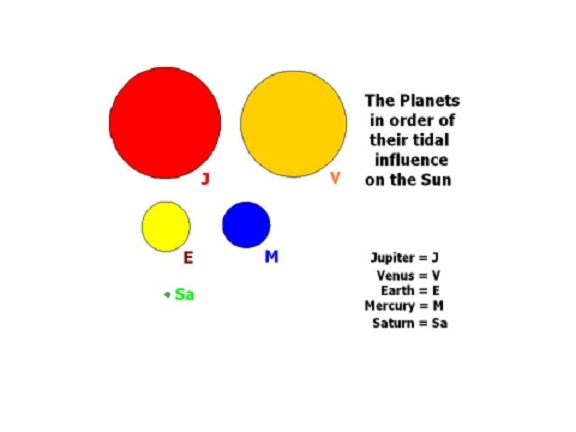 The combined tidal force of Venus and Earth produced two tidal bulges upon the surface of the Sun located at A and B.
bulges at A and B. 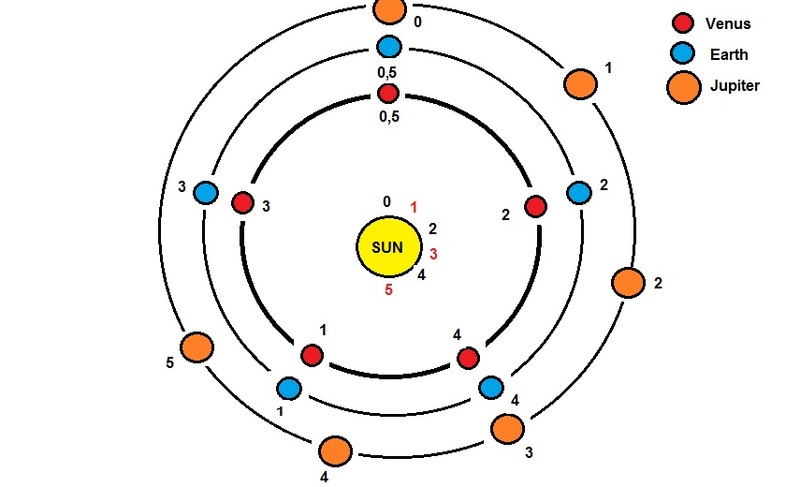 Let Rs be the radius of the Sun = OA = OB. 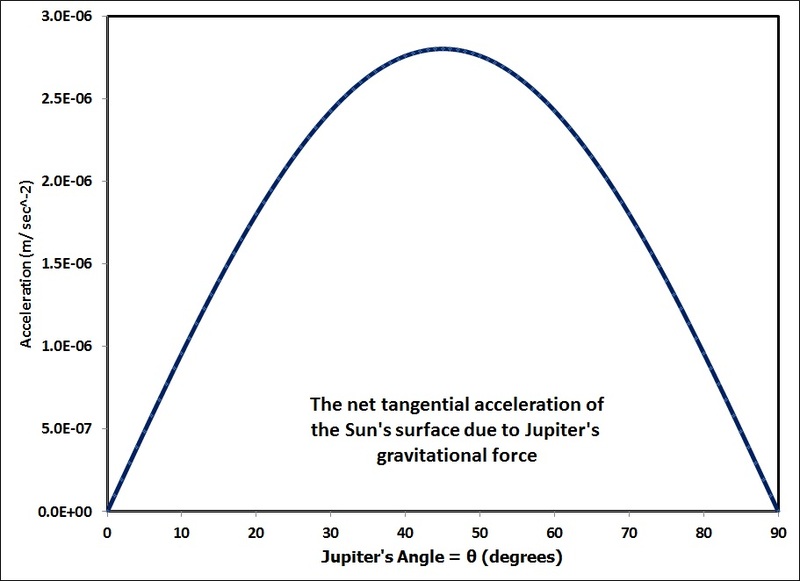 as a function of Jupiter's angle θ (please refer to diagram above). only reaches ~ 3.0 micro-metres per second^2. change rotational velocity of this small amount of mass. we have no idea of its relative mass. loose upper bound to the real value. 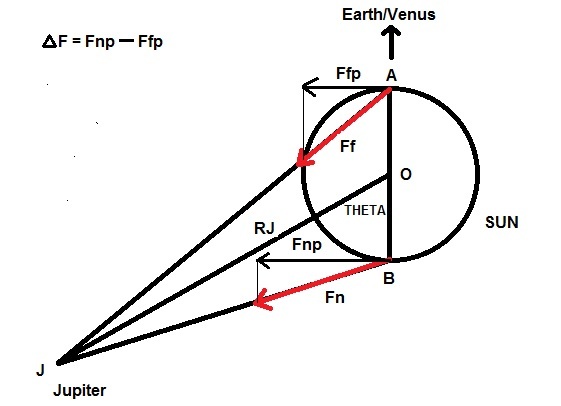 Venus and Earth at the time of alignment). rotation in the outer layers of the Sun. and as yet unknown amplification mechanism . the Jovian Planets Govern the Solar Cycle? 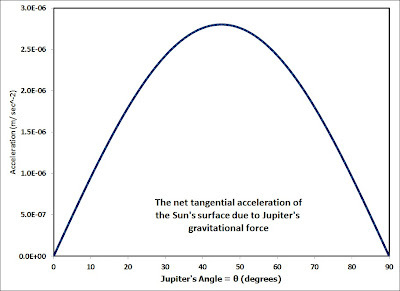 bulges and either slows down or speeds up the Sun's rotation. as Jupiter tugs on the tidal bulges. 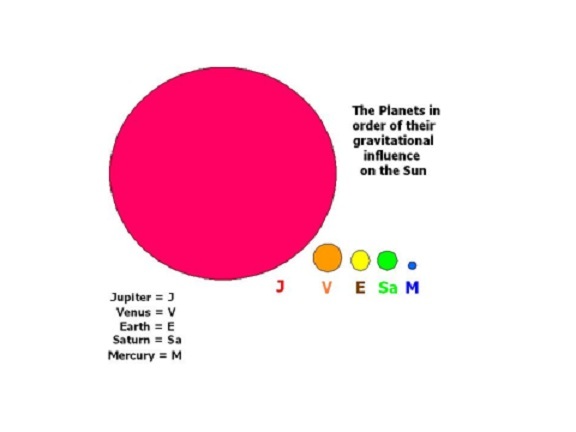 the black 0 just above the Sun's surface). on the tidal bulges, slightly increasing the Sun's rotation rate. and so it will stop increasing the Sun's rotation rate. mean length of the Schwabe Sunspot cycle (11.1 +/- 1.2 years). 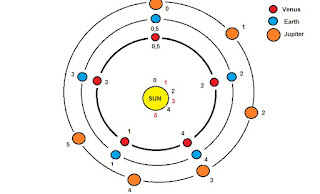 Hence, the basic unit of change in the Sun's rotation rate (i.e. (4 x11.07 years =) 44.28 years. alignments at sub-multiples of Jose cycle 178.72 years i.e. suggested by Wilson et al. (2008). that are observed in the level of Solar activity. This 26 x 178 years (Jose cycle) = 4628 years. to the long term solar cycle called the Hallstatt cycle. Abstract: This study looks for evidence of a correlation between long-term changes in the lunar tidal forces and the interannual to decadal variability of the peak latitude anomaly of the summer (DJF) subtropical high pressure ridge over Eastern Australia (LSA) between 1860 and 2010. A simple "resonance" model is proposed that assumes that if lunar tides play a role in influencing LSA, it is most likely one where the tidal forces act in "resonance" with the changes caused by the far more dominant solar-driven seasonal cycles. 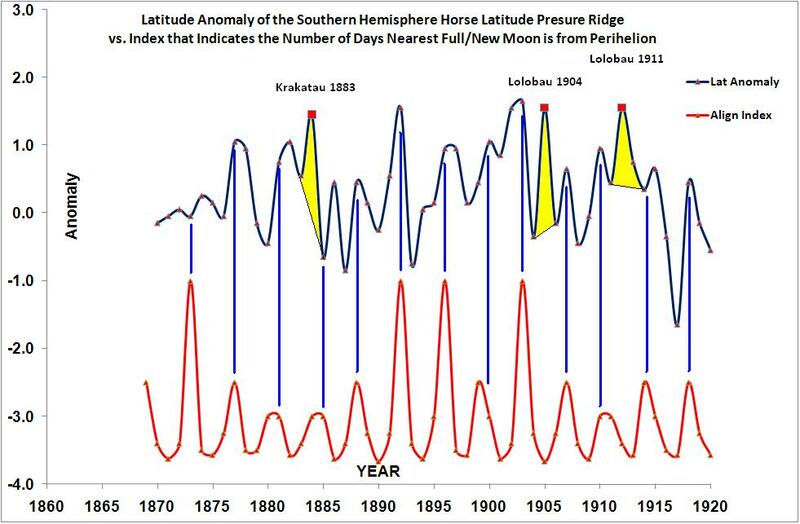 With this type of model, it is not so much in what years do the lunar tides reach their maximum strength, but whether or not there are peaks in the strength of the lunar tides that re-occur at the same time within the annual seasonal cycle. The “resonance” model predicts that if the seasonal peak lunar tides have a measurable effect upon LSA then there should be significant oscillatory signals in LSA that vary in-phase with the 9.31 year draconic spring tides, the 8.85 year perigean spring tides, and the 3.80 year peak spring tides. 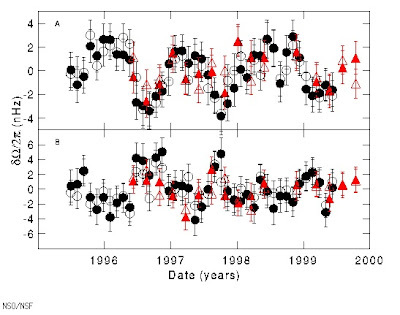 This study identifies significant peaks in the spectrum of LSA at 9.4 (+0.4/-0.3) and 3.78 (± 0.06) tropical years. In addition, it shows that the 9.4 year signal is in-phase with the draconic spring tidal cycle, while the phase of the 3.8 year signal is retarded by one year compared to the 3.8 year peak spring tidal cycle. 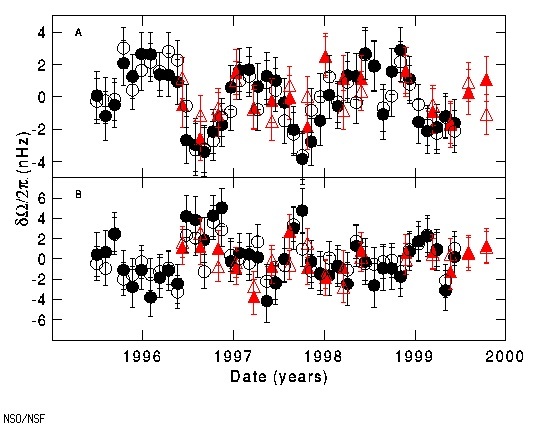 Thus, this paper supports the conclusion that long-term changes in the lunar tides, in combination with the more dominant solar-driven seasonal cycles, play an important role in determining the observed inter-annual to decadal variations of LSA. Important blog sites that are discussing this paper. 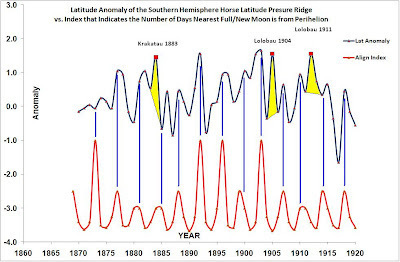 The above graph shows that there is actually quite a good match between the number of days the nearest Full/New moon is from perihelion and the peaks in LSA (see the diagram below). In fact, the correspondence between the peaks in the data sets are (generally) so good, that it is possible identify peaks in LSA that are caused by large Plinarian [> 4] volcanic eruptions to the near north of Australia. (i.e. in the Indonesian Archipelago (e.g. Krakatoa in 1883) and New Britain). A recently published paper that supports the assertion that atmospheric tides can have an influence upon regional weather patterns on times scales of ~ two weeks. Received 22 July 2011; revised 13 October 2011; accepted 13 October 2011; published 15 December 2011.
periods may be significantly improved.